Marionette uses Backbone Radio channels and events to create an easy way to communicate between components, when in the same time components does not know about others. In this post they will be used to display list of moves (veery simplified version) and to catch event in application class — for example, to send move to server. Of course, also this.fieldClickedChannel.on method can be used, but it set this to channel, and I wanted to have easy access to View’s methods and properties. 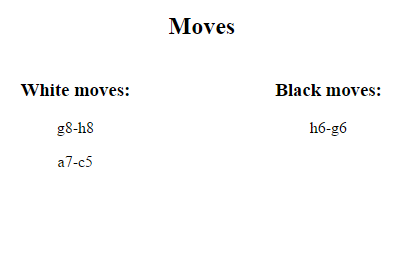 And when move occurred, it emits another event with move object. Destructuring assignment syntax, which even gives us a possibility to set default arguments values. onMove handler may be used to, for example, send data to server. This is another simple, yes useful thing I learned about Backbone with Marionette, but I need time to be familiar with Channels/Events, cause all the time it tricked on me and I spend on them too much time.